The Men's Essens Mimic Hood from Hagl�fs uses synthetic QuadFusion Mimic insulation, which has the extraordinary warmth of down, but retains excellent performance even when wet making it ideal for damp environments. 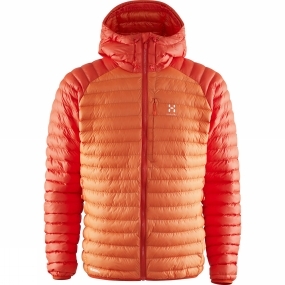 The Pertex Microlight fabric is lightweight but durable and resilient while the QuadFusion insulation is held in stitched through micro-baffles that help reduce migration to ensure consistent warmth throughout the jacket. The stretch bound cuffs and hem make for a great fit everytime without the faff of adjustments while the hood can be cinched in for a snug fit when there is a particularly frosty chill in the air.